Who Is at Fault When Bad Things Happen on a Boat? As the weather truly begins to warm up, Floridians will begin to take advantage of the natural resources this state has to offer. And probably the most-used natural resource is water. Florida has more coastline than any other State save Alaska, and that doesn’t even count the many lakes and rivers within the state. However, being on the water does have its risks, and sometimes, this risk can result in boating accidents, which may necessitate retaining the services of an experienced attorney. Cognizant of the fact that Floridians and visitors alike will want to spend as much time as possible on the water, the Florida Wildlife Commission recently issued a caution to the public to not only understand safe boating, but to practice it. A previous post discussed the requirements of prudent operation of a marine vessel in accordance with the Florida Vessel Safety Law, and the discussion below will focus on negligence as applied to boating accidents, as well as a look at some of the more common causes of boating accidents. Alcohol-related accidents. Again, due to the image of relaxation and the enjoyment of being on a boat, individuals may imbibe more than they would if on land. Additionally, being outside without shade and in the heat of the sun can exacerbate alcohol’s effects. 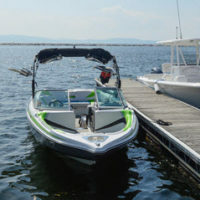 Operating a boat at a high a rate of speed leaves very little time for the operator to react if something happens, given the fact that the boat is on water where turning is more difficult than in a vehicle on land. Skill in operating a boat comes with time and practice, and a novice operator may not recognize trouble until it is too late. Operator distraction. A corollary of inexperience (although distraction can happen to experienced operators), being distracted may cause a collision with a partly-submerged object, for example. Controlling a boat in bad weather is nearly impossible. Further, although counterintuitive, even good weather may pose a difficulty, in the form of sun glare. Equipment failure. Mechanical failure can be serious if it occurs far from shore, and may make it extremely difficult to reach land safely. Lack of safety equipment. A boat operator is required to have sufficient safety equipment onboard, and failure to do so may pose great danger. If you, or a loved one, was injured, or killed, in a boating accident, and you believe operator negligence may be at fault, contact the attorneys at Pita Weber Del Prado as soon as possible. We have experience in boating accidents, and will work with you to get you the compensation you deserve. Contact our Miami office today for an initial consultation.